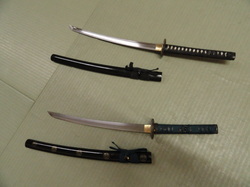 Standard size and most common type of Japanese sword. 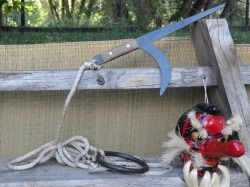 The Shinobigatana or Ninja-to has a shorter blade with a regular size 'tsuka' or handle. 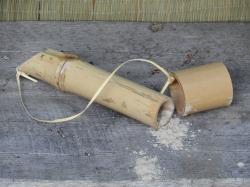 The sheath or 'saya' is normal length to conceal items or messages. The shorter blade also alows for a quicker draw. Literally 'short sword', it's also used to refer to the shorter sword worn by the samurai class. A short, one edged knife. 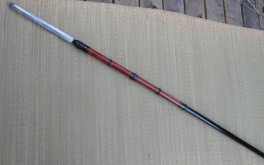 3ft stick, or 'walking cane' height. 4ft walking staff or 'chin height', depending on school. Wooden training sword, the Subarito is a heavier version. Equivalent of a halberd, has a variety of blade shapes and sizes. 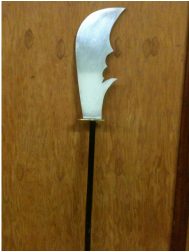 Large bladed halberd, very heavy and difficult to wield. 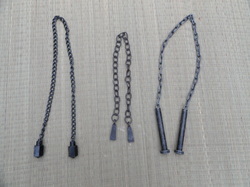 A short length of chain with small iron weights at either end. 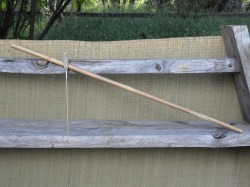 A combined spear tip and sickle, attached to a long chain with an iron ring at the other end. 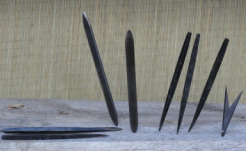 Throwing weapons, flat metal plates with three or more points. Throwing weapons, spike or needle shapes. Spiked weapons usually thrown on the floor to slow enemy pursuit and damage feet. 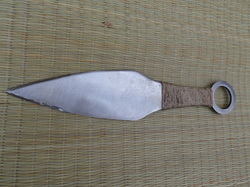 A utilitarian digging, fighting, or throwing tool. Simliar to a trowel. 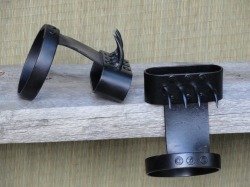 Spiked band worn around the hands. A hollow tube to shoot darts or breathe underwater with. 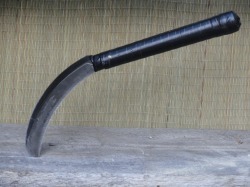 A sickle typically used for gardening. A sickle, with a short length of chain attached, and an iron weight at the other end. 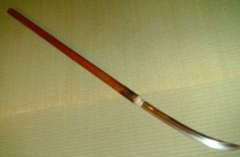 A sword-breaking and restraint weapon, that looks like half an Okinawan Sai; a metal rod with a grip at one end, and a spur. 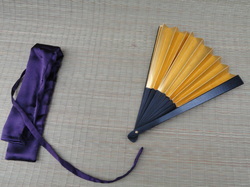 An iron fan, either one that can open and be used, or just a solid bar made to look like a real fan. "Sight removers" or 'Destroying the eyes', containers that held blinding powders to inhibit the enemy.